After a few dozens pages, my first reaction was: “How will I do to get through this unusual book?” But after a hundred pages, when I finally get it, I was captivated. The questions are always the same: when do they learn to program, what are their most memorable programs, what they’ve discovered along the way, what is the most difficult bug they have tracked, etc. But the answers always reveal something interesting, something different, proofing expertise has not a unique path way. There are not purists or craftsmen. Working software is always the goal. That contrasts greatly with common literature. One thing for sure, interviewed coders does not have the same job than most of us have today. They learned on constrained machines where optimization was required and assembly language a reality. So, most of the content will not be immediately valuable on your daily job but if you read between the lines, this book will have a real impact on the way you approach your career. My only regret with Coders at Work is the absence of code that could have to better illustrate keys statements. But considering the vast diversity of languages, the fact of some programs are only in the head of their creators and the book is already 600 pages long, the author probably did a wise choice. In the end, rare are the books with so many different perspectives. Coders at Work is a first step to understand what are the practices of top performers in our field to help us go further. 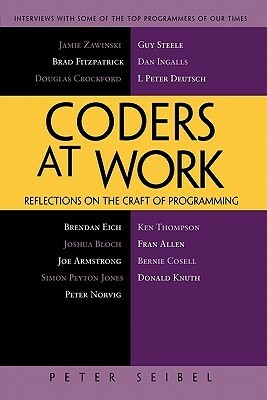 I recommend this book to the experienced programmer aspiring to learn from his predecessors.